Global Positioning System (GPS) is a system of earth-orbiting earth satellites that allow users to determine their exact locations on the earth. The City of Austin utilizes ESRI's Collector and Survey 123 to collect data in the field. Parks and Recreation Department's (PARD) has extensive GIS databases that supports the department as a whole and other City of Austin Departments. 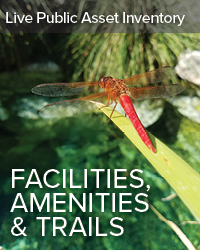 We utilize GIS for asset and maintenance management, park planning and design, parkland dedication, community gardens, mowing schedules and locations, forestry, historic resources, etc. To download GIS data, click on the link below. For inquiries about Parkland and Boundaries, please contact PARD Planning. For Inquiries about Assets, contact PARD Asset Management (Allison Hardy). The products above are for informational purposes and may not have been prepared for or be suitable for legal, engineering or surveying purposes. They do not represent an on-the-ground survey and represent only the approximate relative location of property boundaries. These products have been produced by the City of Austin for the sole purpose of geographic reference. No warranty is made by the City of Austin regarding specific accuracy or completeness.